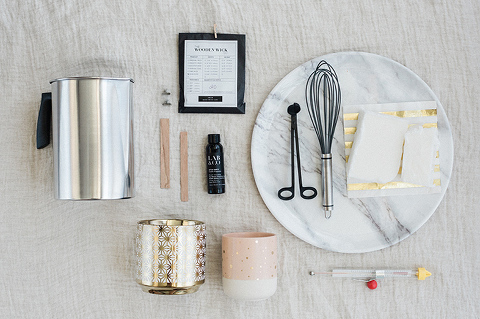 If I had to name just one DIY project that I’ve always wanted to learn how to do, it would definitely be candle-making. The project has been at the top of my must-try list for years—since before I even launched this blog seven years ago! The only excuse I can give for waiting so long to give it a shot is intimidation. I’ve always imagined the process of candle-making to involve a lot of tedious steps and maybe even a little bit of danger since melted hot wax is involved. Well, as you can probably guess from the title of today’s post, I finally, FINALLY crossed this crafting to-do off my list. The other exciting news to report is that it’s not even close to hard to pull off at home. 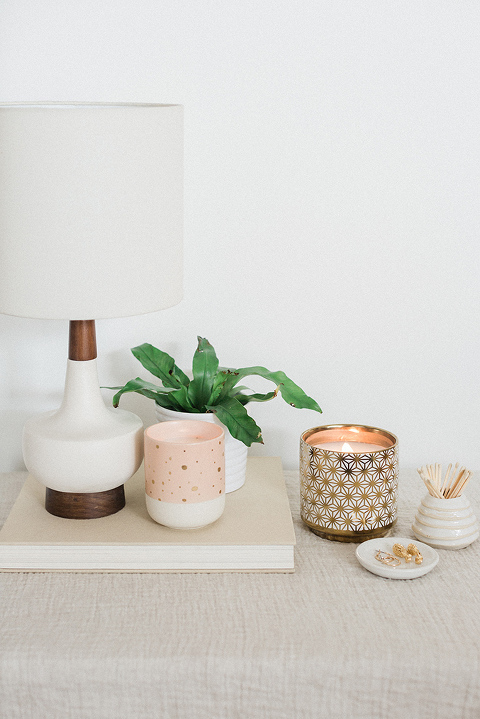 I had completely blown everything out of proportion in my mind because candle-making is easy, relatively quick, and, frankly, a whole lot safer than some other DIY projects I’ve worked on. Scroll on to learn more about the process I went through (including a new video!) with a little help from LAB & CO. Carefully clean the inside of your vessels using a damp rag or paper towel. Allow the vessels to dry out completely while working on the next step. Cut wax into chunks using a knife, and place them in a pouring pot. Boil water in a large traditional pot on the stove, then loop the handle of the pouring pot over the side of the traditional pot. The wax will start to melt over the boiling water, so be sure to regulate the heat with a candle thermometer. Your thermometer will either come with instructions that detail the right temperature to shoot for, or (if your thermometer is like the one I used) the side will be marked to the ideal temperature and you can just keep an eye on that. While the wax is melting on the stove, slide your first wooden wick into a clip. Press a wick sticker on the bottom of the clip and remove the protective film on the very bottom. Press this now-sticky side to the inside center of your vessel, and repeat on however many candles you plan to make. If you don’t have wick stickers, note that double-sided tape works in a pinch. Once the wax is completely melted and has reached the ideal temperature, remove the pouring pot from the heat and set it on a heat-resistant trivet. Next, gently pour fragrance into the melted wax, and whisk for 120 seconds. Pour the fragrant melted wax slowly into each of your vessels, stopping about 1/2 an inch or 1 inch from the top. Let the candles cool for 24 hours before handling to allow the wax to fully harden. Cut the wicks down using wick trimmers, then light your candles to finish. Note that you’ll want to trim your wicks down pretty close to the surface of the wax. I left mine too long (about 1 full inch showing above the wax) and had to blow them out and re-trim because the wicks were smoking too much when lit. Cut your own wicks to a 3/16-inch height for a nice, even burn. And that, my friends, is all there is to it! Candle-making is positively addicting once you get over the myth that it’s too complicated to try at home. In fact, I had enough extra wax left over that I turned a few of my favorite pieces of handmade pottery into candles while I was at it. 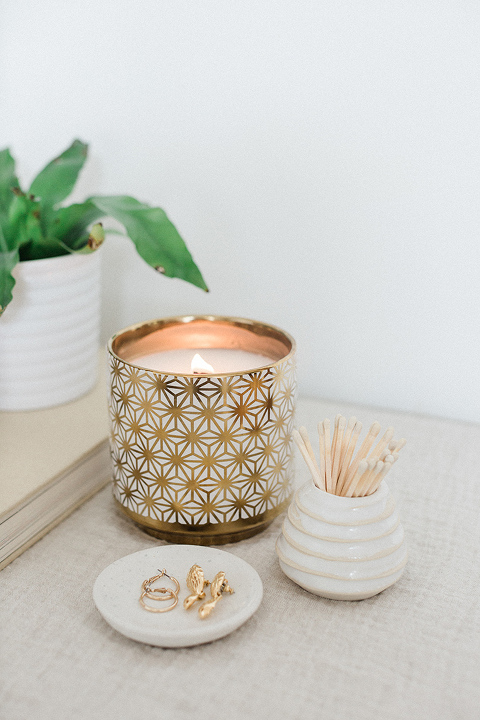 I really wish I could let you smell these candles through the screen, too, because the scent is pretty much pure joy. I have the big gold one burning right here beside me as I type this, and I swear it’s making my day at least 20 percent better. Click ‘Play’ on that video above (or hop over to YouTube here) to watch the whole simple process in action, and then let me know in the comments if you’ve ever given candle-making a try at home. Was it as hard as you thought it would be? 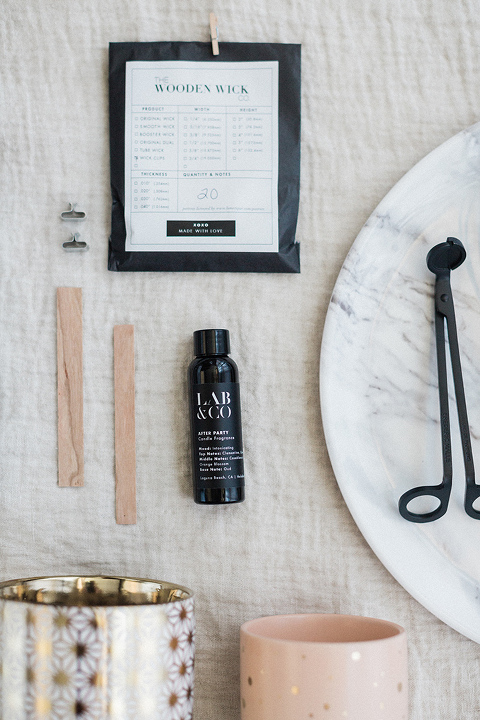 Check out the LAB & CO website for more how-to resources, plus a whole shop full of supplies. Happy candle-making!